The 11-step guide to applying for and setting up a Google Ad Grants account. With this step-by-step guide, you will learn how to take your nonprofit through the application, set up and launch of a Google Ad Grants account so that they can start benefiting from $10,000 per month of free online advertising via Google AdWords. When Google says they are “Changing the world, one country at a time” they certainly mean it. Over 20,000 nonprofits in more than 50 countries around the world currently participate in the Ad Grants program. If your nonprofit isn’t one of these then it is time to apply and get approved today so that you can start marketing your nonprofit for free with a $10,000 per month Google Ad Grant. Several years ago, apply for Google Ad Grants was a bit more complicated and took several months to get approved. In fact, it took nearly 9 months for one of my clients to get an approval back. That is certainly not the case today and Google has made great strides in improving the application process of the program. So much so, that these days, we could have a nonprofit approved and up and running in under 5 days in some cases! However, as much as the Ad Grant application process has improved over the years there are still several steps to go through before the campaigns are launched and generating traffic for your organization. With the following 11-step guide, you will learn how to apply for Google Ad Grants so that you can get your nonprofit set up as quickly as possible. See if you’re eligible for Google for Nonprofits. Not all nonprofit organizations are eligible for the Google for Nonprofits program. Please read the eligibility guidelines before applying to see if your nonprofit is likely to be approved. Assuming you’re eligible, you’ll need to apply for Google for Nonprofits. ● Have your EIN, mission statement and other relevant organization information on hand.Most applications can be reviewed within a few seconds of submission. This part of the application process is quick and easy. Do it today. IMPORTANT: Always do this yourself. Do NOT have an agency do this for you. It is important that the nonprofit be the one to register. If you need assistance, Kinsey Street consults on this for free. As mentioned above, most applications can be reviewed within seconds. However, in some cases an application may require a closer look, in which case you’ll receive a decision within two business days. You can also check the status of your application at any time by logging in to your Google for Nonprofits account. Create an AdWords account for use with Ad Grants. Once your AdWords account is created, you are now ready to enroll in Ad Grants and submit your AdWords account for review. Sign in to your Google for Nonprofits account. Make sure to sign in using your Google for Nonprofits administrator account which is the account that you used when you first applied for Google for Nonprofits. 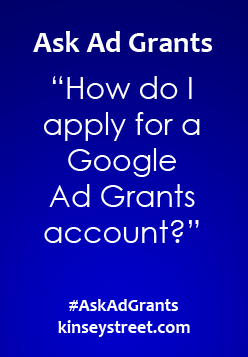 It may be different than the account you used to create your Google Ad Grants account which you’re enrolling. Click the ‘Sign up now’ button. Click the ‘Enroll’ button beneath Google Ad Grants. Confirm that your AdWords account is configured correctly. If you followed the Ad Grants Account Creation Guide it should be but here is your chance to double check before submitting. Enter the customer ID of the AdWords account you created in the form field and complete the form. After you’ve submitted your application, you’ll receive a decision within 5 business days (But often less than 48 hours.) If your AdWords account was set up correctly using the Ad Grants Account Creation Guide, you’ll get an email telling you that your account has been activated. If your AdWords account contained any errors, you’ll get an email with instructions on how to correct the errors before we can activate it. Now that you have learned how to apply for Google Ad Grants take the steps today to get your nonprofit set up with $10,000 per month in free advertising via Google AdWords. We can help.